All students will undertake three assessments in the second year of the programme, with HL students undertaking one further assessment. Solo theatre piece: Students at HL research a theatre theorist they have not previously studied, identify an aspect(s) of their theory and create and present a solo theatre piece (4-8 minutes) based on this aspect(s) of theory. Director’s notebook: Students at SL and HL choose a published play text they have not previously studied and develop ideas regarding how it could be staged for an audience. 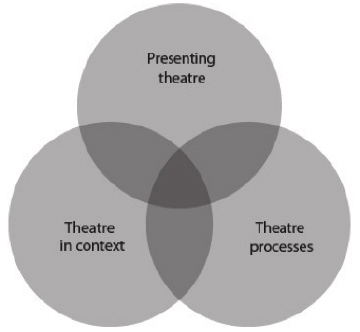 Research presentation: Students at SL and HL plan and deliver an individual presentation (15 minutes maximum) to their peers in which they outline and physically demonstrate their research into a convention of a theatre tradition they have not previously studied. Collaborative theatre project: Students at SL and HL collaboratively create and present an original piece of theatre (lasting 13 to 15 minutes) for and to a specified target audience, created from a starting point of their choice.